Images of meteors in our atmosphere and comets farther out in the solar system. Meteors were raining down the sky on the peak night of the Geminid meteor shower. Back in August, when I wrote my column for the November-December issue of our Canadian magazine SkyNews, I noticed how good the circumstances were this year for the annual Geminid meteor shower. Normally one of the best showers of the year, if not the best, the Geminids were really going to perform in 2017. The Moon was near new so its light would not interfere. For western North America, the peak of the shower was also timed for midnight on the night of December 13/14, just when the radiant of the shower was high in the sky. The Geminids rain down the sky from the radiant in Gemini high overhead on peak night. So in August when I saw the favourable combination of circumstances, I decided a meteor chase was in order. While the shower would be visible from home, Geminid peak night in December is often bitterly cold or cloudy at home in Alberta. So I planned a trek to Arizona, for the shower and the winter sky. While skies at home proved decent after all, it was still a chase worth making, with the shower visible under the perfectly clear and dry skies of southeast Arizona. My chosen site was the Quailway Cottage near the Arizona Sky Village, the chosen dark sky site for many amateur astronomers, and at the foot of the Chiricahua Mountains. Skies are dark! The Zodiacal Light (left) and Milky Way over the Chiricahuas. The Zodiacal Light was brilliant in the southwest sky for several hours after sunset. A tough sighting at this time of year from most sites, this glow was obvious in the Arizona sky. It is sunlight reflecting off cometary dust particles in the inner solar system. Geminids streaking from Gemini as the winter sky rises. On the peak night, the visual impression was of meteors appearing at a rate of at least one a minute, if not more frequently. A tracked composite looking up toward Orion and Gemini. The images here are all composites of dozens of exposures taken over 2 to 5 hours, stacking many meteors on one frame. So they do provide an exaggerated record of the shower. Meteors weren’t filling the sky! But you certainly did not have to wait long for one to appear, making this one of the best meteor showers in many years. Geminids falling over the Chiricahuas as Orion sets at the end of the peak night. Most of the Geminids were of average brightness. I didn’t see, nor did the camera catch many very bright “bolides,” the really brilliant meteors that light up the ground. A bright Geminid pierces Ursa Major. Nevertheless, this was a night to remember, and a fine way to end what has been a superlative year of stargazing, with a total solar eclipse, great auroras, and for me, a wonderful stay under southern skies on an April trip to Australia. All the best of the season to you and your family and friends. Clear skies! Here’s to 2018, which begins with a total eclipse of the Moon on January 31. 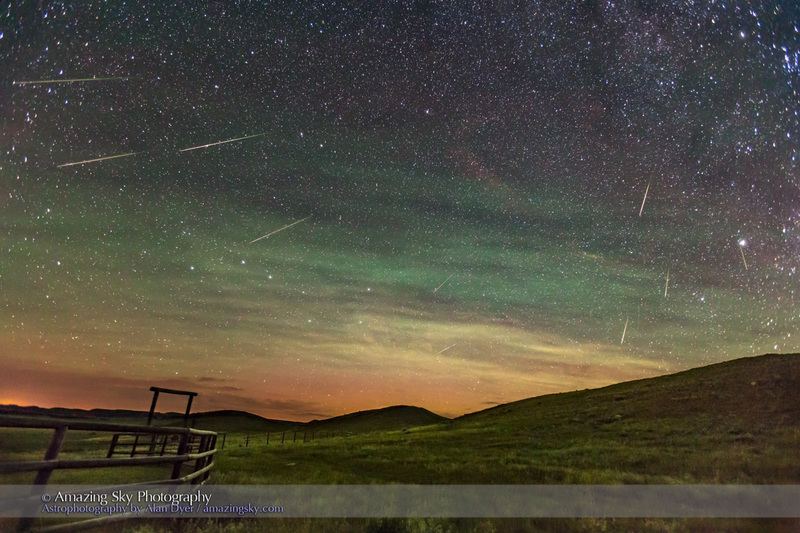 It was a great night for shooting meteors as the annual Perseids put on a show. For the Perseid meteor shower I went to one of the darkest sites in Canada, Grasslands National Park in southern Saskatchewan, a dark sky preserve and home to several rare species requiring dark nights to flourish – similar to astronomers! This year a boost in activity was predicted and the predictions seemed to hold true. The lead image records 33 meteors in a series of stacked 30-second exposures taken over an hour. It shows only one area of sky, looking east toward the radiant point in the constellation Perseus – thus the name of the shower. Extrapolating the count to the whole sky, I think it’s safe to say there would have been 100 or more meteors an hour zipping about, not bad for my latitude of 49° North. A lone Perseid meteor streaking down below the radiant point in Perseus, with the sky and landscape lit by the waxing gibbous Moon, August 11, 2016. Perseus is rising in the northeast, Andromeda is at right, with the Andromeda Galaxy right of centre. Cassiopeia is at top. Taken from the 70 Mile Butte trailhead in Grasslands National Park, Saskatchewan. The early part of the evening was lit by moonlight, which lent itself to some nice nightscapes scenes but fewer meteors. The 2016 Perseid meteor shower, in a view looking north to the Big Dipper and with the radiant point in Perseus at upper right, the point where the meteors appear to be streaking from. This is a stack of 10 frames, shot over one hour from 1:38 a.m. to 2:37 a.m. CST. The camera was on the Star Adventurer tracker so all the sky frames aligned. The ground is from a stack of four frames, mean combined to smooth noise, and taken with the tracker motor off to minimize ground blurring, and taken at the start of the sequence. All exposures 40 seconds at f/3.2 with the 16-35mm lens and Canon 6D at ISO 6400. But once the Moon set and the sky darkened the show really began. Competing with the meteors was some dim aurora, but also the brightest display of airglow I have even seen. It was bright enough to be visible to the eye as grey bands, unusual. Airglow is normally sub-visual. But the camera revealed the airglow bands as green, red, and yellow, from fluorescing oxygen and sodium atoms. The bands slowly rippled across the sky from south to north. Airglow is something you can see only from dark sites. 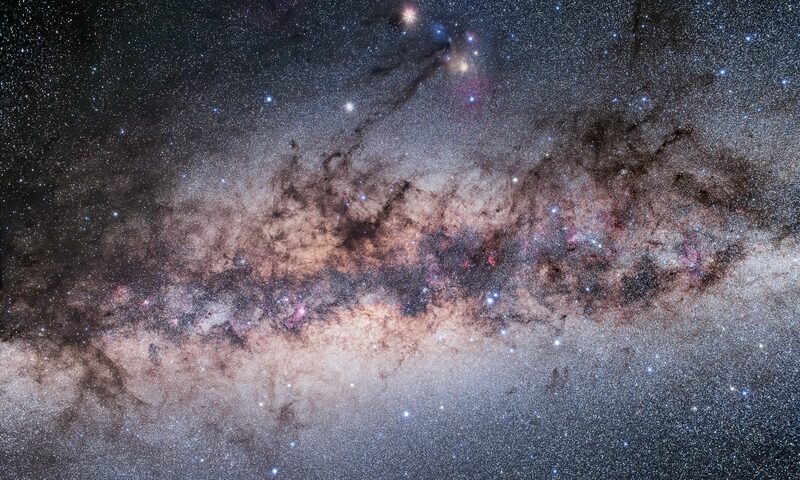 It is one of the wonders of the night sky, that can make a dark sky not dark! The lead image is stack of 31 frames containing meteors (two frames had 2 meteors), shot from 1:13 am to 2:08 a.m. CST, so over 55 minutes. The camera was not tracking the sky but was on a fixed tripod. I choose one frame with the best visibility of the airglow as the base layer. For every other meteor layer, I used Free Transform to rotate each frame around a point far off frame at upper left, close to where the celestial pole would be and then nudged each frame to bring the stars into close alignment with the base layer, especially near the meteor being layered in. This placed each meteor in its correct position in the sky in relation to the stars, essential for showing the effect of the radiant point accurately. Each layer above the base sky layer is masked to show just the meteor and is blended with Lighten mode. If I had not manually aligned the sky for each frame, the meteors would have ended up positioned where they appeared in relation to the ground but the radiant point would have been smeared — the meteors would have been in the wrong place. 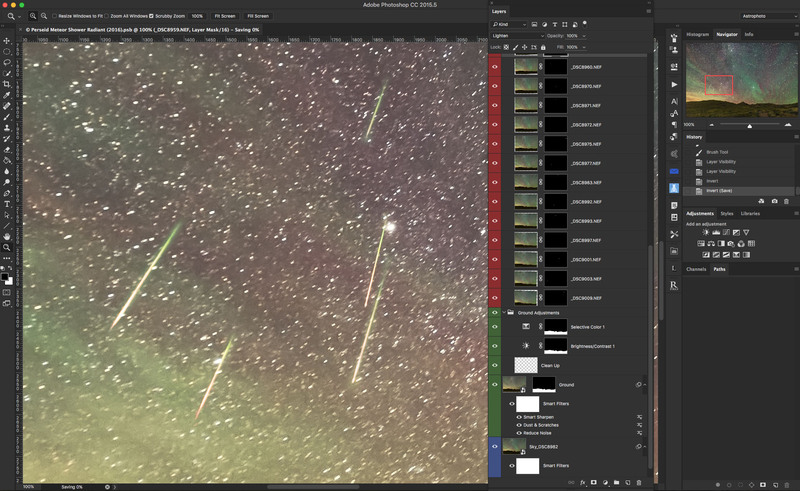 Unfortunately, it’s what I see in a lot of composited meteor shower shots. It would have been much easier if I had had this camera on a tracker so all frames would have been aligned coming out of the camera. But the other camera was on the tracker! It took the other composite image, the one looking north. The ground is a mean combined stack of 4 frames to smooth noise in the ground. Each frame is 30 seconds at f/2 with the wonderful Sigma 20mm Art lens and Nikon D750 at ISO 5000. The waxing Moon had set by the time this sequence started, leaving the sky dark and the airglow much more visible. The Quadrantid meteors streaked out of the northern sky on a fine winter’s night. The temperature was mild and skies clear in the early evening for the annual Quadrantid meteor shower. This is a prolific but short-lived shower with a brief peak. The cold and low altitude of its radiant point keeps this shower from becoming better known. This was the first year I can recall shooting it. I had some success during a 2-hour shoot on January 3, from 9 to 11 pm MST. 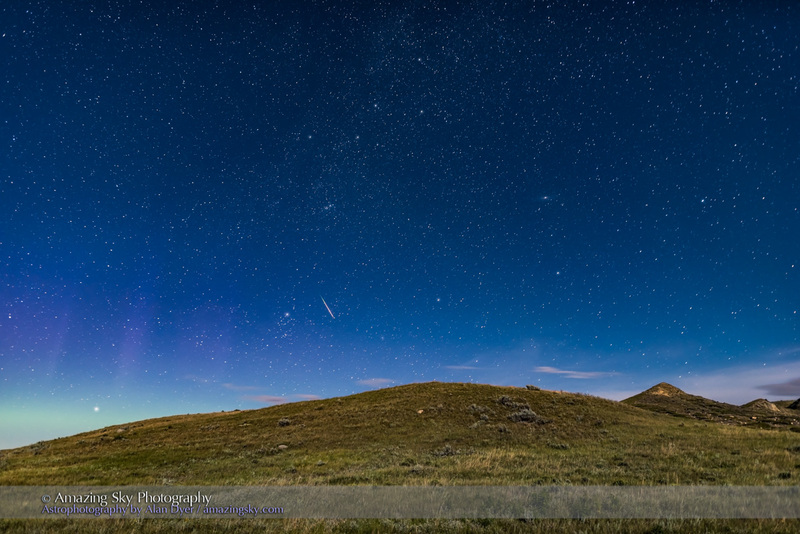 The result above is a stack of 14 images, the best out of 600 shot that recorded meteors. The ground and sky comes from one image with the best Quad of the night, and the other meteor images were masked and layered into that image, with no attempt to align their paths with the moving radiant point. However, over the 2 hours, the radiant point low in the north would not have moved too much, as it rose higher into the northern sky. Most of the meteors here are Quads, but the very bright bolide at left, while it looks like it is coming from the radiant, it is actually streaking toward the radiant, and is not a Quadrantid. But oh so close! I left it in the composite for the sake of the nice composition! Light clouds moving in added the natural star glows around the Big Dipper stars. All frames were 10 seconds at f/2 with the 24mm lens and Nikon D750 at ISO 3200. Meteors from the Geminid shower rain over the dishes of the VLA radio telescope. Sunday night was a prime night for the annual Geminid meteor shower, one of the best of the year. To capture it, I traveled to the Plains of San Agustin in the high desert of New Mexico. It’s there that the National Radio Astronomy Observatory operates the 27 dishes of the Very Large Array radio telescope, one of the most photogenic – and photographed – astronomical facilities in the world. I set up at a viewing point near the entrance, to look northwest over the dishes, arrayed that night, and all season, in its most compact configuration, with all the dishes clustered closest together. It was an active meteor shower! One particularly bright meteor left a persistent “train” – a smoke trail that lasted over 15 minutes. It creates the fuzzy cloud around the meteor at right. The bright bolide is on two frames, as the shutter closed then opened again as the meteor was still flying! So its bright streak got cut in two. Pity! I shot with two cameras. The image here is from one, using a 35mm lens to shoot 334 frames over 3 hours. Each exposure was 32 seconds at f/2 and at ISO 3200. I’ve taken about two dozen of the frames, the ones with meteors, and stacked them here, with the sky and ground coming from one frame. The camera was not tracking the sky. Bands of natural airglow and clouds illuminated by the lights of Albuquerque to the north add colour to the sky. I would have shot for longer than three hours, but this was a very cold night, with a brisk wind and temperatures below freezing. A snowstorm had even closed some roads the day before. Three hours was enough on the high plains of San Agustin this night. Comets, Conjunctions, and Occultations, Oh My! What a morning of sky sights, both before dawn and after sunrise. December 7 – This was the prime day I came to Arizona to enjoy, to be better assured of clear skies. As it turned out this will likely be the cloudiest day of the week here, but skies were clear enough for a fine view of a conjunction and an occultation. The comet was a bonus. This is a stack of 5 exposures: 30, 8, 2, 0.5 and 1/8s, blended with luminosity masks as HDR would not blend images with such a large range of brightness and content, with the shortest exposures having almost no content execept for two bright objects! The camera was on the iOptron Sky-Tracker to follow the sky and keep the sky targets stationary and aligned, thus the blurred foreground. All with the 135mm lens at f/2.8 and Canon 6D at ISO 400. At 4 a.m. the waning crescent Moon rose accompanied by Venus, as the two worlds appeared in close conjunction in the pre-dawn sky. The view above captures the scene as the Moon and Venus rose over the Peloncillo Mountains of New Mexico. Comet Catalina is in this scene but barely visible. This is a stack of 6 exposures: 30, 8, 2, 0.5, 1/8s and 1/30s, blended with luminosity masks as HDR would not blend images with such a large range of brightness and content, with the shortest exposures having almost no content execept for two bright objects! The camera was on the iOptron Sky-Tracker to follow the sky and keep the sky targets stationary and aligned. All with the 135mm lens at f/2.8 and Canon 6D at ISO 800. An hour or so later, with the Moon and Venus higher and with skies a little less cloudy, I was able to capture this scene, above, that included Comet Catalina, as a tiny blue dot next to Venus and the Moon. But if I hadn’t labeled it, you wouldn’t know it was there! The comet is proving to be less wonderful than anticipated, and any cloud dims the view even more. I had hoped for a superb scene of a bright comet next to the two brightest objects in the night sky. But comets do what comets do — surprise people with unexpected brightness (as Comet Lovejoy did last January) or with disappointing dimness … or by disappearing altogether, as Comet ISON did two years ago. I came here in December 2013, to this same location on the Arizona-New Mexico border, to catch ISON but no luck there at all! This is a stack of 7 exposures from 10 seconds to 0.3 seconds at 1 stop intervals and blended with luminosity masks, to compress the huge range in brightness from the bright Moon and Venus, plus horizon sky, and the darker sky and sunrise clouds. All with the 35mm lens and Canon 6D. Regardless of the comet, the conjunction of the Moon and Venus was stunning, about as good as such events get. Here’s the view, above, an hour later again, with the eastern sky brightening in the dawn twilight. The only thing that would have made this event even more spectacular is if the Moon had actually covered up Venus in this twilight sky. Not quite. The occultation of Venus by the waning crescent Moon in the daytime on Monday, December 7 at 9:30 am local time. This is just about 3 minutes before the actual occultation as the advancing Moon is about to cover Venus on the bright limb of the Moon. This is a frame from a 100-frame time lapse. Unfortunately, as I shot this on my trip to Arizona, I did not have more focal length than the 135mm and 1.4x extender used here. For the occultation itself, we had to wait until well after sunrise for an event in the blue daytime sky, at 9:30 a.m. local time. All of North America got to see this fairly rare occultation of Venus by the Moon, albeit in the daytime. Nevertheless, the two objects are so bright, this was visible to the unaided eye, even with some cloud about. In binoculars it was wonderful. To shoot it, all I had was a telephoto lens, so the image scale doesn’t do the event justice. But the image above provides a good impression of the binocular view, with Venus as a brilliant jewel on the “ring” of the Moon.